Hotels and all details will be arranged for you. Call or email. This program is intended to allow horse-breeders and horse-enthusiasts of all kinds to become thoroughly familiar with traditional Hungarian stud horses including the famous, pure-bred Shagya-Arabian breed which originated at the Bábolna Stud Farm (est. 1789). Cultural side visits available. The program is flexible and can be modified to suit your own particular desires. 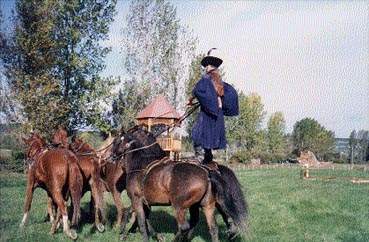 An Expert in Hungarian Horse-Breeding will be your guide for the entire tour. Five days visiting different Stud Farms in the picturesque Hungarian countryside, including the world-famous Bábolna Stud Farm established by the Emperor Joseph II in 1789. 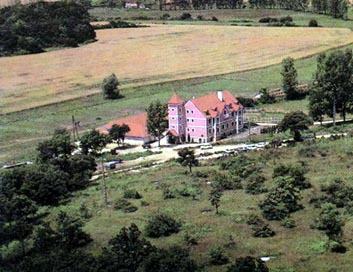 Additional stud farm visits at Nagycenk, Hortobágy, Bugacpuszta, and Rádiháza. Visits to Festetics Castle and Tihanny Abbey included. Located on Europe's largest lake. Deluxe hotel and riding inn accommodations includes full-board . View a short history of the Bábolna Stud Farm. Cultural side visits (wine-tasting, opera, music festivals, sights & attractions can be arranged to suit your individual desires. Contact Us for more particulars. 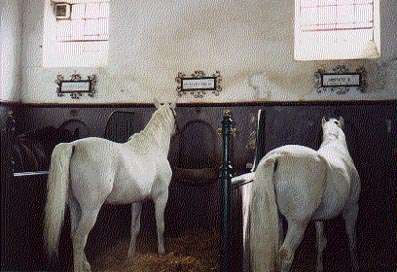 Tours are also being arranged to facilities which breed and train the world-famous Lippizan breed of horses, ridden at the Spanish Riding School in Vienna. 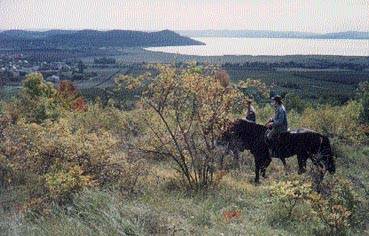 Lippizaner breeding in Hungary is centered around Csipkéskut on the Bükk Plateau, and dates back to 1806. Stud farm visits to the Hungarian National Stud Farm &/or private stud farms. 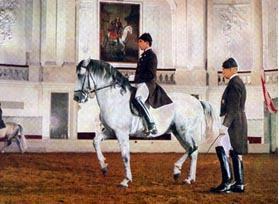 Click for more Lippizaner information. Six full days for the passionate rider. This program offers an excellent opportunity for horse-enthusiasts to become acquainted with Hungarian riding facilities and horsemanship. Ride point-to-point with a guide through the beautiful Hungarian countryside along carefully-selected, scenic routes. Horse drawn carriages accompany the riding party for those who either don't ride or who might prefer a more sedate pace. Enjoy picnic lunches along the route and luxurious accomodations at a different Riding Inn each night. Lessons with an instructor are also available for those who would like to give riding a try. A typical day consists of a 4-5 hour ride with picnic lunch enroute. 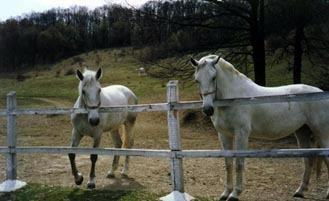 For those who desire them, riding lessons are 2-3 hours and include a picnic lunch. A typical itinerary for one of our tours appears below. ADDITIONAL RIDING TOURS including our newest tour to the Inner Somogy (the Green Corridor of Hungary), can be viewed here. April through October. Minimum of 2 participants. Suggested riding apparel: breeches and riding boots. Local rentals available. Hungary offers exceptional value right now.